President Trump and Supreme Court Justice Anthony Kennedy, who announced his retirement on Wednesday, at the public swearing-in ceremony for Justice Neil Gorsuch at the White House in April 2017. Trump will announce his pick to replace Kennedy on July 9. The president also said he wouldn't ask potential justices about their position on Roe v. Wade, the 1973 decision legalizing abortion rights. Many who favor the decision fear that a more conservative replacement for Kennedy, often a swing vote on social issues, could endanger such rights, while Trump's base has hoped he would appoint someone to overturn the decision. Trump made clear during the presidential campaign that he would appoint justices who would oppose abortion. "If we put another two or perhaps three justices on, that's really what's going to be, that's what will happen," Trump said of overturning Roe at the final presidential debate in October 2016. "And that will happen automatically, in my opinion, because I am putting pro-life justices on the court." Of potential justices who are on his shortlist, Trump pointed earlier this week to the 20 names he first listed during the 2016 campaign as possible candidates, with five additional names recently added. Trump's first Supreme Court appointee, Justice Neil Gorsuch, came from that initial list. One person on that list of names is Utah Sen. Mike Lee. Trump said that the GOP lawmaker "said he'd like the job; usually they don't say that." 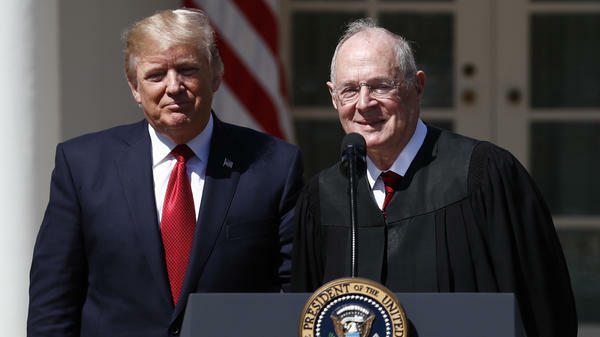 The 81-year-old Kennedy announced his retirement on Wednesday, giving Trump his second seat on the court to fill since he took office in January 2017. "From Day 1, I've heard, outside of war and peace of course, the most important decision you make is the selection of a Supreme Court judge, if you get it," Trump said on Friday. "And as you know there have been many presidents that never got a choice. You know, they went four years, they went eight years and they never got a choice, and here we are at two already." Trump nominated Gorsuch to fill the seat of the late Justice Antonin Scalia, who died in February 2016. Senate Majority Leader Mitch McConnell refused to consider President Obama's nominee, Merrick Garland, citing the coming presidential election later that year. That infuriated Democrats, who say that McConnell's push to confirm Trump's nominee now before the November midterms reeks of hypocrisy.